Newly-released 4K Ultra-HD versions of "Star Trek" (2009) and "Star Trek Into Darkness" (2013), plus the new Blu-ray Director's Edition of "Star Trek II: The Wrath of Khan" (1982). 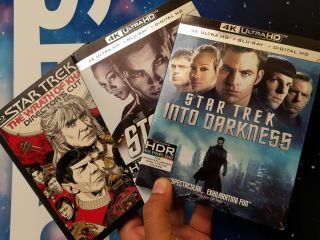 Just in time for the 50th anniversary this year of the beloved "Star Trek" franchise, Paramount has released its two most recent films, 2009's "Star Trek" and "Star Trek Into Darkness" (2013), in the new 4K Ultra-HD Blu-ray format. The classic "Star Trek II: The Wrath of Khan" (1982) Director's Edition was just released for Blu-ray as well, for the first time ever. Besides a picture quality that boldly goes where no home-release has gone before, both of the recent movies will come with bonus material: "Star Trek" will have more than 3 hours of behind-the-scenes content, and "Star Trek Into Darkness" will include the IMAX version of the film and more than 2 hours of special features, including "Spock" originator Leonard Nimoy discussing his legacy and role in "Star Trek" and the new movies. (Nimoy, who died in 2015, played a parallel-universe version of Spock in the two movies. The new "Wrath of Khan" release includes the director's cut and the original theatrical cut, both digitally remastered in high definition. The Blu-ray release also includes a new 30-minute documentary called "The Genesis Effect: Engineering The Wrath of Khan" about the film's production, as well as more than 2 hours of special features that have been released before. The newest movie in the rebooted franchise, "Star Trek: Beyond," will be in theaters July 22.